This was to be any easy rode trip, about 25 miles, out Kerr Creek to Gettys Creek and Mt. Gilead. We doglegged over to Robinson Rd, and took Nerhtz. We climbed the little hill, and then my chain broke (again). The guys at Bike Garage had fixed the chain and ordered a new one, so I knew I was taking a chance. Jojo was able to grab the back of my seat, and pulled me along the ridgetop. This was a tough ride, kind of cool, which was fine till my chain broke (again), and we had to fix it as the snow fell. Jojo was with me and we worked for a half hour to get it “fixed”. Truth is I missed threading the 10 foot chain through the front derailleurs, so I had only my highest gear. Even so, I made it up Firehouse Hill and back to town. I know that I might break down at any time, that’s part of the adventure. It is good to know I can fix things and get back some of those times. I’ve had to call Eileen for a pickup only 2 or 3 times in the past 5 years, twice at dusk, once because I had no tubes or repair kit. So now in my pannier I have 2 extra tubes, a small pliers, a tube patch kit, tire tool, a pump, and a set of hex head wrenches. In winter I often carry a thermos of hot tea, food, extra socks, a bird book, and a poncho. So I am usually more than prepared, and even though I carry extra weight, I don’t find it a burden. I may go slower, but I can get farther and be more comfortable during the journey, this I like! On most weekends I try to ride for four hours or more, anywhere from 30-50 miles is great, but during the week, I sometimes want to ride after work, and so 15-20 miles is just about right. Starting at Lampkins Ridge and 446 (which is about 4.75 miles from Sample Gates), the loop goes down Knights Ridge to Gross Road, which runs along a ridge and into the forest. The last mile is gravel and drops into the Salt Creek valley ending at Friendship Rd. It’s then a short ride north to Lampkins Ridge Road, which climbs about 250 feet over 3.8 miles, but only the beginning is really steep. The loop is 9.4 miles, and with the ride from home and back, it is just under 20 miles. There are a couple of ways to get to SR 446, I used Covenanter on the way out, and the Polly Grimshaw trail on the way back. They are about the same distance, but the trail feels safer on the way back after dark. The sun was still up as I rode along Knight’s Ridge Rd, and the sky was blue. But as I turned onto Gross Road, the sun was setting, and the shadows were lenthening. Gross Road is narrow but well paved until it turns to gravel as it enters the uninhabited forest. I stopped in the forest to have a drink and listen to the birds and look for mushrooms. After about 5 minutes, the only car I had seen so far came to a stop and asked if I was heading into the forest on my bike, I had pulled it about 20 feet off the road. I said no, I was heading down to the valley. He said ok, and left, but I realized he was going to warn me about hunting season, and there are people with deadly intent all over the state forest land. I am not so afraid of the bow hunters, they all seem sober, and have to get pretty close to shoot. But it is now firearms season, and I’ve already run into several drunk guys with guns looking for deer. The firearms season for deer runs November 15-30, although muzzleloaders are allowed through December 21. I plan on staying on the roads till next year, that’s for sure. The bowhunters are there only in October and December, so by January the woods are quiet once again. Salt Creek runs next to Friendship Road, and as I walked down to the banks, I heard a loud mechanical sound. I supposed that it was the farmer on the other side of the creek running his combine, but as I got closer, I saw that was not so. A large tractor was backed up to the creek, and was running a pump to bring water up over the levee and into the fields. Later in the week I noticed the whole field was flooded, and I realized the DNR had done this to fill one of the lagoons that had dried up in the recent dry spell. I’ve ridden on the dikes farther south during the dry season, but I did not know the ponds were filled this far north. I started up the Lampkins Ridge hill, and was just near the end of the first steep climb when my chain broke. I didn’t have a link tool with me (I do now! ), and it was dark anyhow. I figured I could walk the bike and coast the downhills, and was about a mile into a 8 mile trek when a van stopped to see how I was doing, this was only the second car that had passed me since I turned onto Gross Rd. The driver was Michael Glasgow, who is a mechanic for DeCycles and a rider himself. He put my bike onto his roof rack, then he took me home, what good luck! Thanks to Michael, and to all those who recognize someone in need and are happy to help. I took the same route late Saturday, and made it the whole way with no problem. When I got to Friendship Road and took a right to the south, it was still light, but within half a mile I found a hunter’s camp along the roadside. The woodsmoke smelled good in the cool evening air, but I decided not to drop in on them, and headed back to Lampkin’s Ridge and home. All in all I like this ride, 5 miles to the woods, then 10 through the back country, and 5 back home, not bad. I had been asked to play at the polls on Election Day, it was thought there would be long lines everywhere. However, this was not the case as all those eager voters had submitted early votes, there were lines at the Curry Building the whole week before the election. I took the day off from work and rode to several polling stations, but I found only bored poll workers, not lines. Around 5 pm I went to the County Courthouse, hoping for a line, but no go. Deke Hager was there, ready to play, as was Katie Hicks with her fiddle. Deke and I sang some tunes, and then Katie and I jammed on some tunes, while Deke took our picture. The one below was fuzzy, but cool, so I ran it through some filters to make “impressionist” rather than photorealistic. Yael showed up with Jarno and Solveg, she did some recording for WFIU. We hung out in the dusk, I got to play with the kids, and finally it was time to go home and make dinner, Eileen worked at the polls all day, from 5:15 am till after 8:00 pm, quite long workday! I’ve just realized that I’ve been putting my favorite parts of the blog at the end of each post. From now on my nature notes will be at the top. This is my main pleasure in riding, those moments where I feel at one with with beauty all around m.
Nature Notes: The leaves are fully turned now, and although yellow predominates, the red, orange and brown leaves are now especially visible. On Getty’s Creek I stopped when I saw a really large pileated woodpecker fly in front of me and call. I looked up and found a hornet’s nest in the tree I was under. I pulled out my camera to take a picture, and heard the unmistakable call of a red tailed hawk as it launched itself from nearby tree and flew out over the valley. Very few flowers and bees were evident, even the goldenrod is gone, but I did find some late chicory and a few asters along the roadside. This Sunday the time changed, I got up “late”, but still got an early start. I wanted to see as much forest color as possible, and I headed for Shilo Road, first riding down newly paved Kerr Creek Road. It has smooth blacktop all along its 3 mile length, and I was able to ride down with no brakes. It is not that big a hill, falling about 100 feet on the main hill. Stipp Road, my favorite downlhill, in contrast drops 180 feet, and I easily hit 40 mph on it. I turned left on Gettys Creek Road, and took Mt. Gilead northwest to SR 46 near Unionville, and rode over to Tunnel Road. Although this route is longer than riding out 10th St. (SR 45), plus a good climb, the valley is really sweet and quiet with colorful ridges on either side. I took Tunnel to Shilo Rd., which to my surprise, is also newly paved! This is a ridge ride of 3.8 miles through the forests that overlook the Bean Blossom valley. Shilo Rd. drops into the valley, crosses the Bean Blossom, and ends on Anderson Road, which I took to Low Gap Road. Low Gap runs north-south through the Morgan-Monroe Forest, rising out of the Bean Blossom valley and up over the ridge and then back down into the Indian Creek watershed southeast of Martinsville. As I passed the parking lot next to one of the forest trails, I saw a group of hikers, and a fully camouflaged bow hunter. At the top of the ridge, I took Orcutt Road to the west, riding “Safety Zone”, where hunting is disallowed. 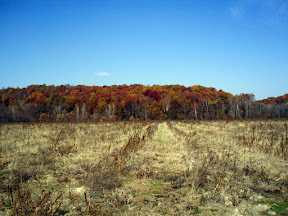 I love the cool beauty of this ridge, and I sometimes ride several miles east through the woods to Bear Wallow Road. But with bow hunting season in full swing, I decided to play it safe and stay on the paved roads as much as possible. On Forest Road, I found the Major Taylor team riding training runs along the ridge. I’ve seen other teams up here, as the five miles from Old 37 to Rosenbaum Road is well paved and level, there are few roads in the county that can say that training. I got inspired and rode back and forth once, admiring the yellow light shining through the trees, the incredibly blue sky, and clean cool air. Eventually I headed home, though I stopped at Bryant’s Creek Lake to take in the view, then again at Melton’s Orchard, it was quite the scene, their parking lot was full of both cars and bikes stopping by for cider and apples, they have a great selection, I will be back! Old 37 is closed just south of Hindustan (where the orchard is), they are repairing a bridge, so while bikes can get through, cars can not, and it was quiet riding most of the way south to Dolan. I rode up Firehouse hill, then cut over on Bethel Lane to Headly Rd and Griffy Lake. Bethel Lane seems very dangerous to me, there are so many blind hills and the cars travel well above the speed limit of 35 mph. But I made it once more, and rolled on down to the lake for a short walk in the woods with Eileen. I was surprised to learn (by plotting my course on Google Earth) that I had covered at least 50 miles (back and forth on the ridge pushed me past 50), and I felt fine (tired, but fine) as I climbed up Headly Rd. hill and back home. Thanks to good advice from Sue Aquila, I had kept my blood sugar levels fairly steady by eating regularly, and I even had some good salty corn chips at lunch, and I did not bonk even at the end.